I’ve been working out lately. Like, a lot. Running every morning (highly recommend the Cto5K app for your phone…), yoga-ing (that’s totally a word, right? ), taking Krav Maga classes, and this month Miss Lulu and I are taking a workshop to learn the dance to “Thriller” for Halloween! So to facilitate all this running and punching and zombie dancing, I’ve been sewing ALL THE ACTIVEWEAR. 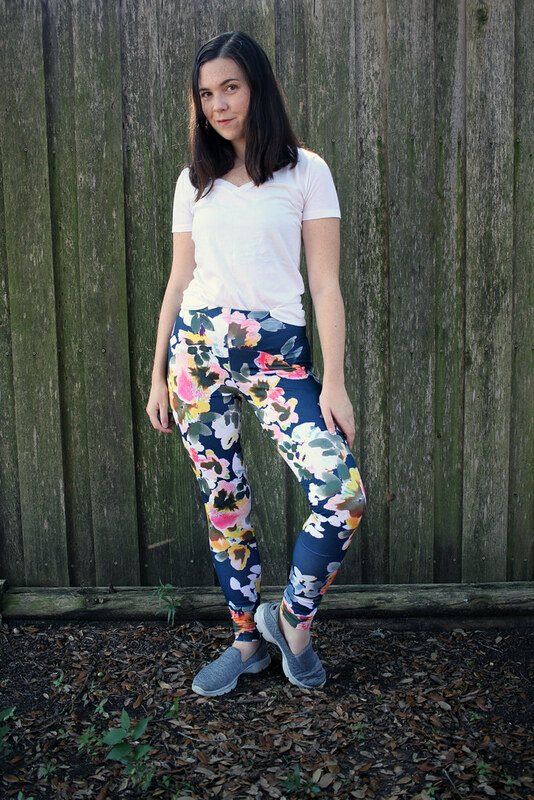 These projects are both the Steeplechase leggings from Fehr Trade. 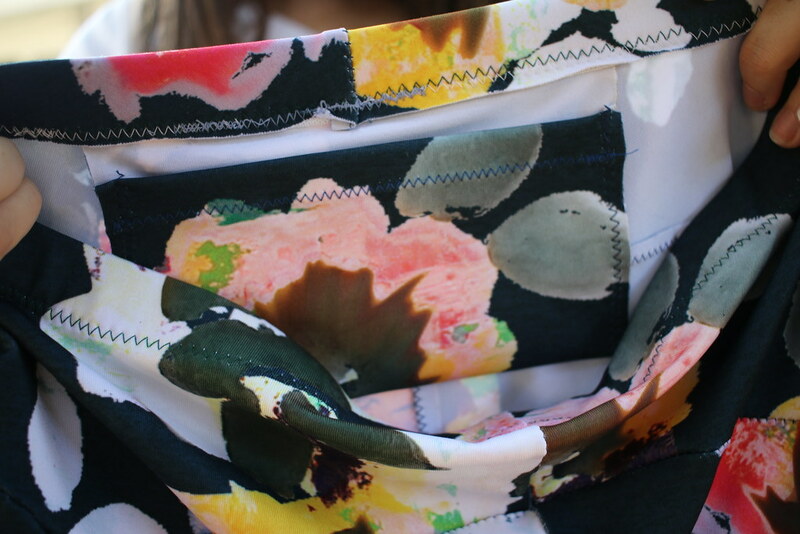 It’s a well-drafted pattern with fun seam lines, perfect for a crazy print. My first pair used a black knit for the yoke and a galaxy print for the legs; both came from Rockywoods.com. 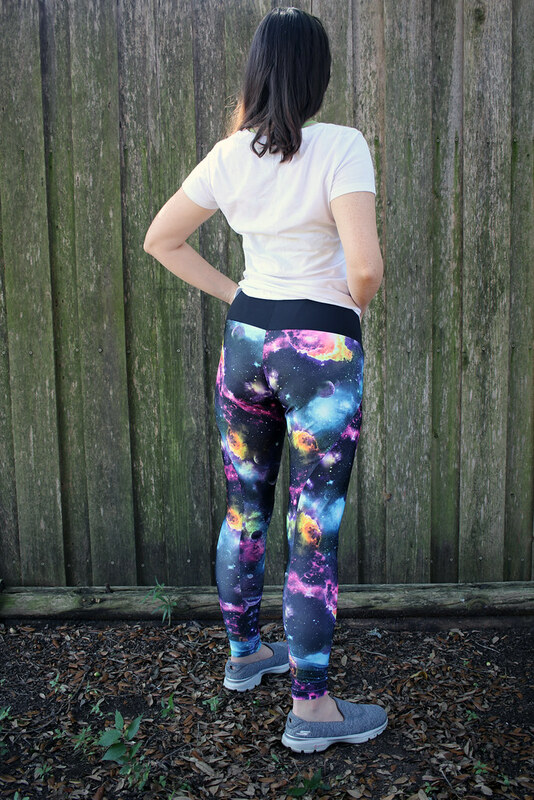 The print is fun but if I had more of the fabric I would have spread the print around more so the big splotched of galaxy wouldn’t be so close together. I had only bought a yard, however. 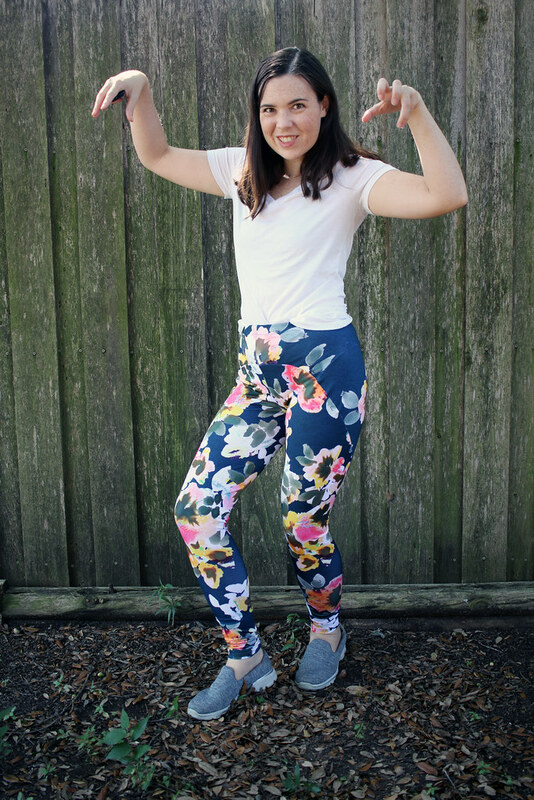 For these leggings, I bought a floral scuba knit from LA Finch Fabrics. I think Finch buys lots of jobbers: ends of bolts and surplus fabric from designers. This print was a little strange, it looked like it was printed specifically for pattern pieces to be cut out from it. For example, the flowers would end abruptly in the middle of the fabric and there was an unprinted horizontal line that seemed to break along yard markings like the fabric was printed in panels. I was able to cut around the weird printing but it’s something to note if you want to buy the same fabric. On this second pair the curved seams around the hips are a little wavy. This could be caused by two reasons. 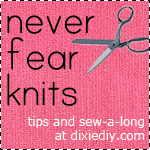 1) After sewing my first pair on my serger I discovered that my serger had major tension issues. The far left thread would snap if you pulled on the seam too forcefully. Obviously, no bueno. So I was forced to re-sew entirely over the existing stitched seams with a zig zag stitch. On this pair I skipped the serger and did zig zag only. This possibly caused the fabric to stretch as I sewed or 2) My assembly method might have been different trying to sew the points at the front hip. Perhaps if I had flipped the fabric and sewn with the opposite layer on top I could have more easily pivoted around the points? Either way, it isn’t a big deal but next time I’ll pay better attention/get my serger fixed. I like the pocket at the back waist, good to hold keys while running or a mouth guard in Krav class. The legs are a little long on me but that may be the fabric, it’s quite stretchy. I could always cut the capri length instead. 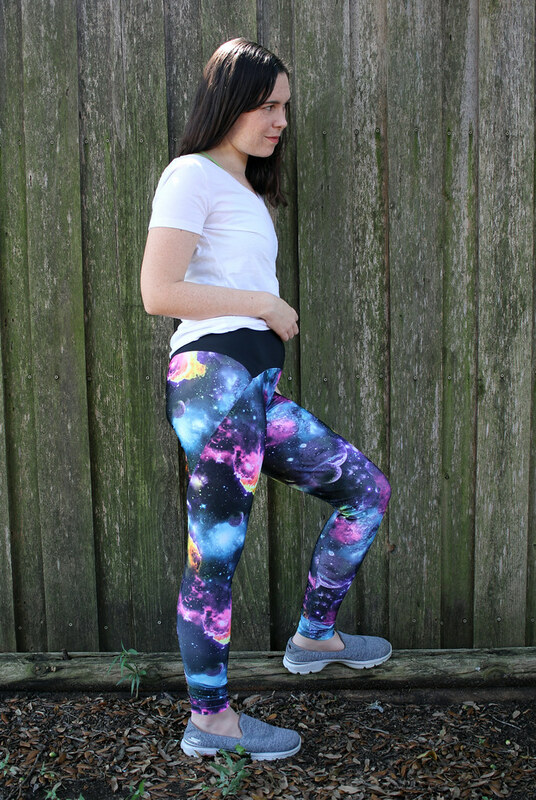 The fact that the leggings have no inseam is a big plus, definitely my favorite feature, but it also makes the pattern pieces extra wide, too wide to lay side by side. Something to think about if you’re buying a wonky stripe or directional print. 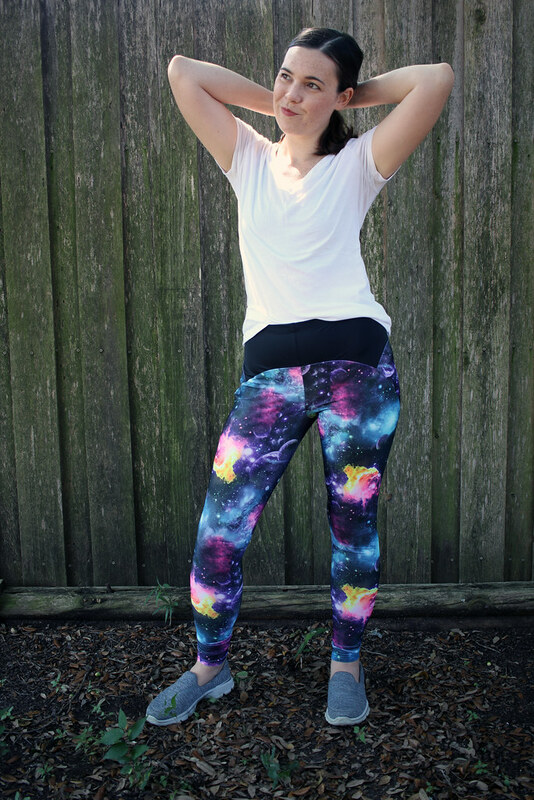 I’ve made two of these leggings now and I wouldn’t be against making them again, but at this point I’d like to try out a new pattern. Maybe the Jalie Cora’s?